There are a bunch of interesting weapons in Destiny 2. Auto rifles, rocket launchers, swords, and weirdo reverse-tractor beams. But which guns are best? Here’s our list of the top five. The exotic scout rifle MIDA Multi-Tool is pretty easy to get. It probably has the least stringent requirements of any of Destiny 2’s exotic quests. Once you get it, you’ll have a gun that lives up to its name. It’s got so many uses! Obviously, it’s good at long range. But it staggers enemies really effectively, so it’s solid at close range, too. You really don’t need to use anything else. The best thing about the MIDA Multi-Tool is that it lets you keep your radar active when you aim down your sights. 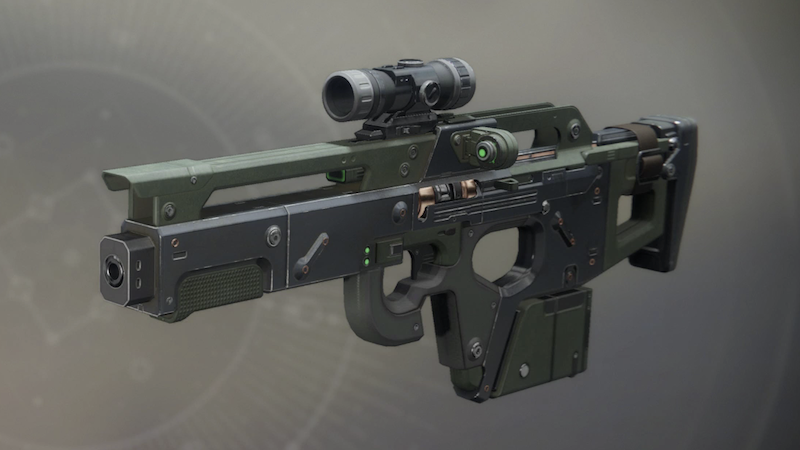 That puts it way above most other guns for PvP, particularly in the more intense modes on the competitive playlist or during Trials of the Nine. Destiny 2 has increased the time it takes for your radar to come back after you aim down the sights of a normal gun, making the MIDA’s radar perk that much more valuable. It’s a no-brainer. There’s plenty of new stuff in Destiny 2, so it’s comforting to use a gun that we’re all already familiar with. MIDA Multi-Tool is one of several Destiny 2 exotics that Bungie carried over from the first game. It’s been floating around the meta since waaaay back in 2014, and it just wouldn’t be Destiny if that weren’t still the case. Sequels are all about using the same guns we’ve been using for three years, right? It’s so nice to stick with what we know. If you’re competing in Trials of the Nine, chances are most of your teammates are going to be using the MIDA Multi-Tool. You wouldn’t want to stick out, right? Of course not! Don’t be a weirdo! You can always equip a good auto rifle in your energy slot, if you really want to use something different from time to time. But let’s be real: if we could have our way, we’d just equip a MIDA Multi-Tool in both slots! We guess that’s what the MIDA Mini-Tool is for. The MIDA Multi-Tool won our hearts years ago with its iconic “death stapler” firing sound, and we definitely have yet to get sick of it! It’s so refreshing to go into a crucible match and immediately hear that clipped thwack coming from every angle. Why use any other gun when you can use one that sounds this good? It’s a fair question. If you came across this article while looking for an actual list of good Destiny 2 guns, I actually posted a list of my favorites in a comment you can read below. Use any of those guns instead of a MIDA Multi-Tool. Please?